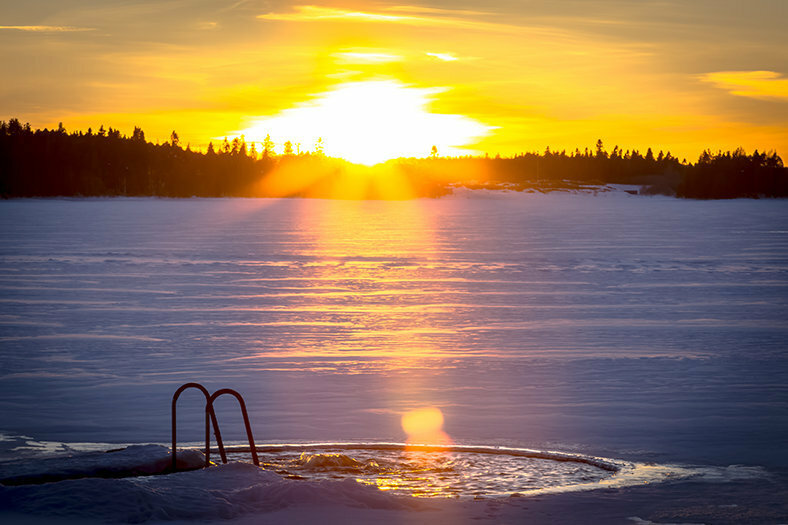 Combination of extremes like hot and cold, sauna and ice swimming, is said to be very healthy. But why on earth to go to swim in freezing cold water after warmth of sauna? The feeling you will get is euphoric. It´s something which is not easy to explain by words, you just need to experience it. It´s said that ice swimming provides you with a better resistance to cold weather improves immune system and helps to breathe and sleep better and releases all the stress. Because of all these effects many people even get addicted to ice swimming in Finland. Ice swimming is more like a dip into water or moving a short distance in the cold water. If your condition is normal and you don´t have any problems with heart, blood pressure or else, ice swimming is safe. If any doubts or identified healthy problems, ice swimming is not recommended without doctor´s opinion.